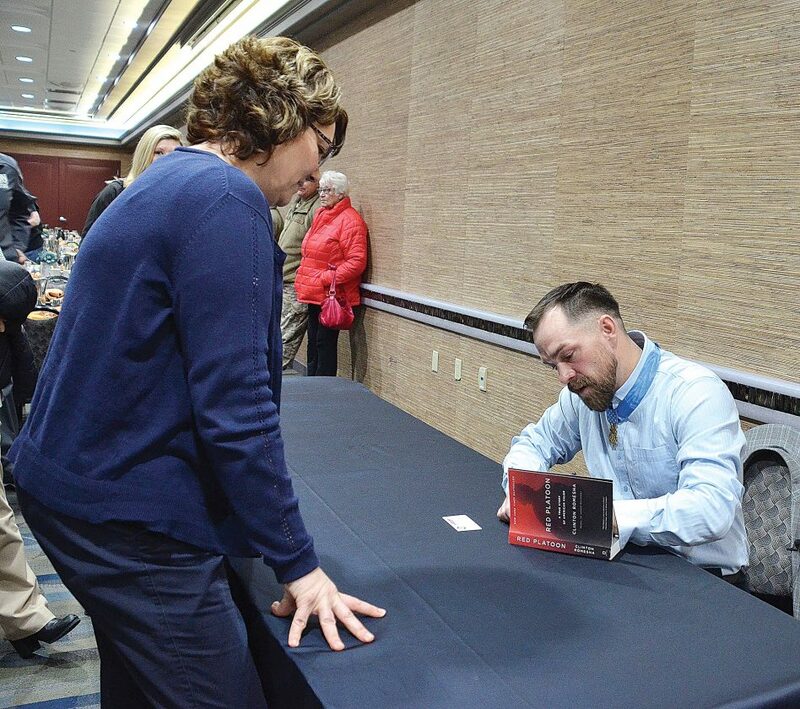 Eloise Ogden/MDN Clint Romesha, Medal of Honor recipient, signs a copy of his book, “Red Platoon,” for Hiedi Miller, director of the Minot Vet Center, following his presentation to the Minot Young Professionals Network’s in the Grand Hotel, Minot, on Wednesday. “I still believe that to this day. I did a job that any other person put in that position would have done,” Romesha told about 100 people attending his presentation to the Young Professionals Network in the Grand Hotel on Wednesday. He’s also the author of “Red Platoon,” a firsthand account of the firefight with Taliban insurgents at Combat Outpost Keating in Afghanistan on Oct. 3, 2009. The Medal of Honor is the highest award for valor action against an enemy force which can be bestowed upon a person serving in the U.S. military. A former U.S. Army staff sergeant who lives in Minot, Romesha received the medal from President Obama during a ceremony in the White House on Feb. 11, 2013, for his actions during the 14-hour firefight when Taliban insurgents attacked the outpost in Afghanistan in October 2009. Eight Army members lost their lives in the battle. 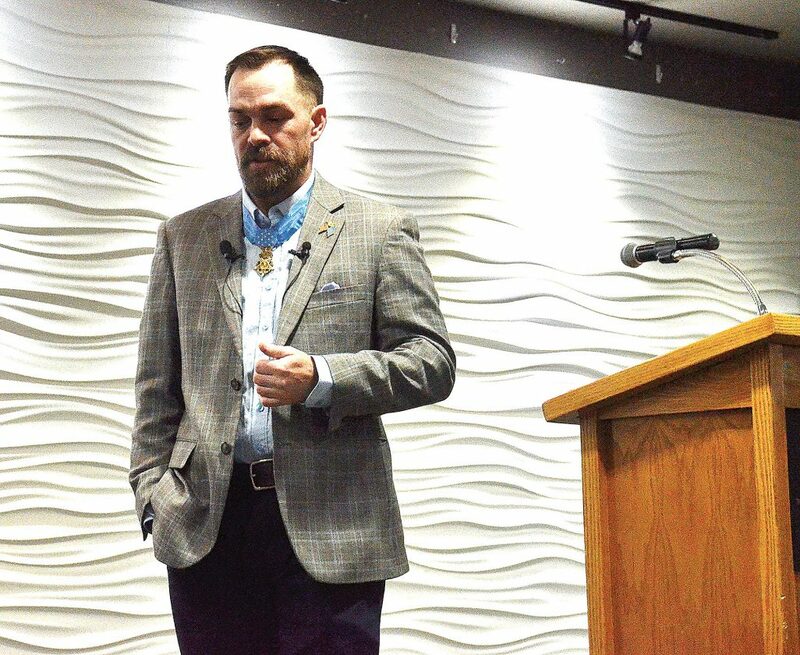 Eloise Ogden/MDN Medal of Honor recipient Clint Romesha of Minot makes a point during his presentation to the Minot Young Professionals Network in the Grand Hotel in Minot on Wednesday. During his presentation Romesha gave the group a detailed report on the battle in Afghanistan that day in October 2009, sharing it with the YP audience, including many military members attending. He said many people call him a hero. “I’m not. I don’t feel that way. I never have. I always thought of myself as a warrior…” he said. He said true heroes are the ones who don’t come home. “I think we need to remember that every day – never forget, always remember,” he said. “And that motivational love will get people out of a foxhole and run for the machine gun every day. And that’s the biggest difference between what we are as Americans and what the rest of the world is, is we do it out of love, not hate,” Romesha said. When he was presented the Medal of Honor Romesha said he remembers as the citation was being read and he stood up to receive the medal, right before the president put it around his neck he looked out and in the front row he could see his family, Gold Star family members behind them and to the left were the guys he was with that day of the battle in Afghanistan. He said he thought how tragic something like this had to happen but how amazing it was to be there not just with his family but with his Gold Star family and his military family all under one roof. “We’re all one big family sharing this moment together,” he said. Originally from California, Romesha came to North Dakota to work in the oil fields and settled in Minot. “It’s so great to be here in Minot. I love it, I never thought in a million years that I’d ever make it to North Dakota and then all of a sudden I realize I’m transitioning out. I’m coming up north to chase the oil fields and once I got here I fell in love with it because it’s you people, this community,” Romesha concluded.